iedmont has made progress like almost no other wine region over the past 30 years. While radically different approaches to winemaking have accentuated the stylistic differences possible from the noble Nebbiolo grape, there are now many outstanding varied examples. High quality is also achieved across a wide range of styles made from the classic Barbera and Dolcetto grapes while superb, exuberant Moscato and enticing dry whites remain under-appreciated. There also a host of lesser known varieties which with improved winemaking now provide more than a passing interest. But what’s really special about Piedmont is man’s connection with the land and the importance of the link between fine wine, the physical environment and the human endeavour therein. It is illustrated as well here as in any wine region in the world. Italy’s smallest region has a distinct French flavour and a wide range of varieties include those of French, Italian and Swiss origins. Nearly all the wines are sold as Valle d’Aosta (or more usually in French as Vallée d’Aoste). Interesting whites include Petite Arvine, Pinot Gris (or Nus Malvoisie) and Chardonnay while reds from Torrette, Fumin and Syrah should be tried. Good examples of all are made by the region’s leading producer Constantino Charrère’s Les Crêtes estate. Late picked or dried moscato grapes can produce a fine sweet wine either as Chambave Moscato Passito (Muscat Fletri) or as a vino da tavola in the case of Les Crêtes. 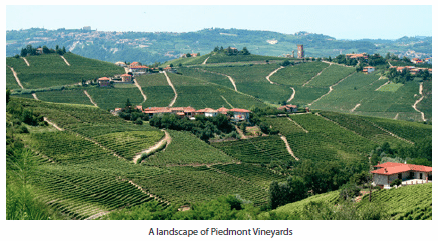 At the heart of Piedmont viticulture are the Langhe hills. The finest grape is Nebbiolo. The two great wines are Barolo and Barbaresco, both DOCG, though some of the best wines from these zones are now sold under the Langhe DOC. One of the region’s greatest strengths derives from its peasant landholding heritage. While commerciante or large négociant houses flogged the grapes of any number of small growers under generic labels in the 1950s and 60s, the subsequent success and leadership of Angelo Gaja and others paved the way for small growers to do likewise – a trend that really gained momentum in the 80s and 90s. Outside money tends to be the exception in Piedmont yet some producers have been highly receptive to new ideas. Both Barolo (a little over 1,500ha) and Barbaresco (just over 600ha) are fairly small wine regions and it is common for growers here to have just one or two hectares of this or that cru. 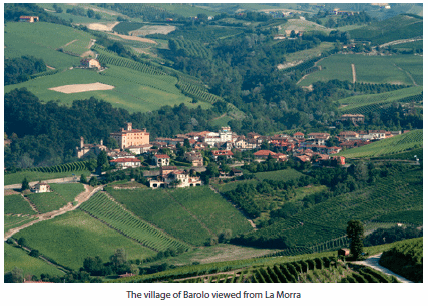 Barolo is spread for the most part over five communes: La Morra, Barolo, Castiglione Falletto, Monforte d’Alba and Serralunga. Verduno is the most significant of six other communes that encroach on the DOCG. The southern part of Monforte and Serralunga (in the east) have mostly the older Helvetian soils, said to favour strength and structure. La Morra soils are predominantly on younger Tortonian soils, a chalky marl giving greater perfume and a less rigorous structure. Between the two there tends to be a mix of the two with varying amounts of sand and clay. More clay can help in very hot years but a higher sand component can improve drainage in cool, wet years. Barbaresco is almost exclusively restricted to just three communes. Almost half of it comes from the commune of Barbaresco, where 60 per cent of the vineyard area is is given over to Barbaresco production, compared to only a little over 20 per cent of the vineyard area in neighbouring Neive and Treiso. Barbaresco generally is slightly less powerful than Barolo, more perfumed and ready to drink a little sooner, but producer and site are the real determinants of style and character. The wines are required to have a minimum of nine months’ wood-ageing and are released a year earlier than Barolo (which must have two years in wood). In both zones much is made of a modern versus traditional approach to winemaking yet the reality is less distinct, with a range of different approaches to vinification and winemaking. The important differences centre around the length of maceration; the type and use of oak (size, age and origin); temperature and style of fermentation; and the type of fermentation vessel – we have tried to highlight some of these differences within the individual producer profiles. Of course these differences apply as much in Burgundy but in this relatively isolated, conservative area the differences of opinion have taken on an extra intensity. There are many outstanding wines across the spectrum. Nebbiolo under other guises includes Carema, Gattinara, Ghemme and Roero. The last, lying on sandier soils across the Tanarò river from Bra and Alba has made great strides during the last decade and can provide stylish complex examples of Nebbiolo at more affordable prices. Piedmont’s second great grape is Barbera, which can take on a number of guises. 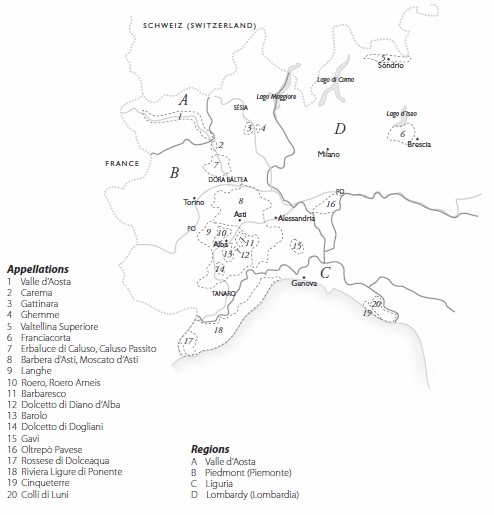 The leading two appellations are Barbera d’Alba and Barbera d’Asti. The Superiore version of the latter is now redefined by three subzones: Colli Astiani, Nizza and Tinella. Barbera has a great affinity with new oak and many of the top examples have spent around 12 months in barriques. Barbera also combines well with Nebbiolo and there are many good oak-aged, deeply fruity, lush examples (typically Langhe DOC) that can be drunk quite young or kept. The more northerly hills of the Asti and Alessandria provinces include similar interesting blends under the Monferrato DOC. Dolcetto doesn’t quite make the cut in fine wine terms, although Dolcetto di Dogliani and Dolcetto di Ovada have been granted DOCG status. It does, however, make both wonderfully fruity everyday wine or something more intense and concentrated and often better with a year or two of bottle-age, depending on its maker. There are three leading manifestations: Dolcetto d’Alba, the small Dolcetto di Diano d’Alba and Dolcetto di Dogliani. Dolcetto is also included in the Monferrato DOC, while Dolcetto di Ovada is mostly of the fruity, juicy type. What else is there? Other natives varieties include Freisa and Grignolino, both sold under most of the regional DOCs, but exciting examples are few. There’s also sparkling red fizz, actually DOCG in Brachetto d’Acqui (from Brachetto) and Malvasia di Castelnuovo Don Bosco from Malvasia Nera. How significant are the French imports? Not very, but Cabernet Sauvignon features in many a Langhe or Monferrato blend (see above), Merlot to a lesser extent. Pinot Nero (Pinot Noir) has yet to really impress, while plantings of Syrah remain small. For whites, most emblematic are the perfumed and characterful Arneis (frequently as Roero Arneis) and relatively high acid Cortese (the best examples sold as Gavi del Comune di Gavi – those at the heart of a wider zone) are the leading native whites. Recently the previously obscure Timorasso grape has been transformed into a characterful white with a lush texture and a ripe peach and tropical fruit intensiy. Other natives include Favorita, a distinctive herb scented wine, and Erbaluce as Erbaluce di Caluso DOGC or the better sweet version from dried grapes, Caluso Passito. Yet the most important white grape in Piedmont is Moscato Bianco. This, the ‘good’ Muscat DOGC (Muscat Blanc à Petits Grains), is very widely planted in the Asti and Alba hills. Good Asti is a well made, sweet party fizz and much better than some of the nasty acidic and green branded stuff made in Germany, France and elsewhere. But Moscato d’Asti, made on a different scale, can be incomparably better. Delightfully perfumed and low in alcohol, it is excellent with fresh fruit. A very small amount of passito-style Muscat is made in an Asti enclave called Loazzolo. Of imports, Chardonnay is the leading variety, usually appearing as Langhe Chardonnay but occasionally under the region-wide Piemonte DOC. Really top examples are relatively few but there is potential here. There are small amounts of Sauvignon, even less Riesling, Viognier and other imports. Ligurian reds are rarely seen outside the region but include Rossese di Dolceaqua DOC from the Rossese grape grown behind Ventimiglia near the border with France and Ormeasco (Dolcetto) grapes under the guise of Rivera Liguria di Ponente from the long strip between France and Genova. Some growers are now producing the likes of Merlot and Syrah for potentially better wines. Most important for whites are Pigato and Vermentino as Rivera Ligure di Ponente varietals, but the latter also in Colli di Luni and Cinqueterre DOCs (from vineyards close to north-west Tuscany and Biachetta Genovese in the Golfo di Tigullo just east of Genoa. Cinqueterre Schiacchetrà DOC is a sweet version made from semi-dried grapes. 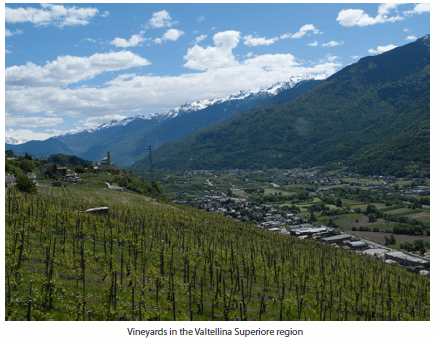 Valtellina Superiore (DOCG) is Lombardy’s most renown red wine appellation. Made almost entirely from Nebbiolo (Chiavennasca) the wines tend to be lighter and more austere than those from the Langhe but the very best examples are stylishly perfumed and well-balanced. The wines may also be identified by one of four subzones: Grumello, Inferno, Sassella or Valgella. Often better are the higher alcohol Valtellina Sforzato (Sfursat), a version made from partially dried grapes. Top examples are powerful and structured with intense sweet fruit that becomes impressively complex with age. The closest Italy has to top Champagne in quality is Franciacorta. Here, near Lake Iseo in Lombardy, Chardonnay, Pinot Bianco and Pinot Nero grapes are combined in serious metodo classico sparkling wines. Satèn is a softer, creamier, low-pressure version. Sometimes very good Terre di Franciacorta reds are made from Cabernet Franc (or, as likely, Carmenère), Merlot, Cabernet Sauvignon and Pinot Nero. Still whites from Franciacorta include high quality Chardonnay. In the east of Lombardy some attractive dry white Lugana is made from Trebbiano di Lugana (see North- East Italy). Although rarely other than ordinary Oltrepò Pavese counts as Lombady’s third significant wine region. The best reds tend to come from Barbera, Bonarda and Cabernet Sauvignon. There is also much Pinot Nero, most of which goes into sparkling metodo classico Talento wines. Decent whites are usually from Riesling, Sauvignon, Chardonnay or Pinot Gris.